Help your ND Miata MX5 breathe easy with the CorkSport Cold Air Intake System. The CorkSport Miata MX-5 CAI (Cold Air Intake) features a CAD designed ABS box and lid, billet aluminum MAF housing and an AEM high-flow dry air filter drawing air from the OEM cold air ducting to provide you with all the cool ambient air the 2.0L needs. Learn more about how we engineered the CorkSport CAI with performance and functionality in mind, and the power we found. #ZoomZoom! 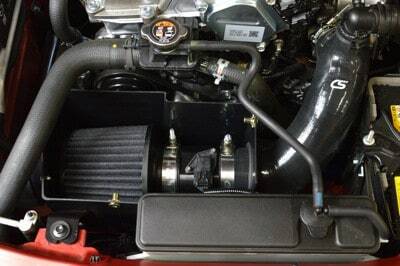 The CorkSport CAI combines the OEM cold air ducting with a high flow intake system for the best of both worlds. The CAI box and lid is CAD designed for a precise fit in your engine bay. The CorkSport CAI also utilizes the OEM rubber isolators for mounting, so installation is a breeze. Abrupt edges in the airflow can cause excessive turbulence which reduces total flow. The billet aluminum MAF housing, high-flow air filter and 4-layer silicone coupler are designed to work together seamlessly to provide smooth laminar flow. 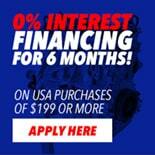 Compatible with: 2016+ Mazda MX-5 Miata, all models. Clamp Option: Choose from polished stainless steel or black zinc coated. It will take you one hour to install the CorkSport ND Miata Cold Air Intake System with our easy-to-use instructions. This is my 3rd Corksport cold air intake for my 3rd Mazda. Installation was a snap ans the fit is superb. Filters are easy to clean when needed and I like the end result on this one as much as the previous 2 (M3 and CX5). We do not sell the components separately. 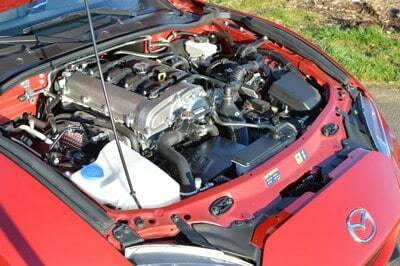 We can tell you that is would be major modifications to get the Mx5 airbox to work in the 3. Correct..yes it would require a bit of modifying. Is the Filter cone same size as 2012 mazda 3 CAI (3")? Can the screws and bolts holding the box be together be taken apart completely? The entire mounting base and MAF/inlet location is not the same. We would not recommend it. Will this work with the 2019+ ND2 updated engine? If not will there be an update to support it? We are looking into this currently. This intake will not fit. The MAF housing, and throttle body is different. Will this kit work on the MX-5 RF? No CEL with the intake. I saw video that a dyno run has been made for the CAI, what is the performance gain against the base car? Also, is there much performance drop when the engine bay temperature for higher?